Manufactured homes use an integral HVAC duct work for the heating and cooling system. The problem I see with most mobile homes duct work is where the boot from the trough comes through the floor, especially if any flooring or floor repairs have been done around the duct work. Quite often there is a gap between the mobile home duct work boot and the floor causing an duct work air leak. This can usually be sealed with a good quality duct tape or silicon caulking, however mastic is the ideal way to do it. Be sure that there is not any damage to the trough that usually runs the entire length of the mobile home, in the case of double wide mobile homes there are two troughs interconnected by a crossover. The double wide mobile homes crossover duct is usually a 14" or 16" flexible insulated duct. Flex duct is rated in "R" values for the insulating properties they possess. You can easily check for trough leaks by going underneath while the air conditioner is on and if you can find a location to stick your hand up through the belly wrap or belly board. If between the insulation and the floor you feel air flowing or cold air you may have a mobile home duct work leak that will require further investigation or the calling of a expert. I completely removed the trough and installed the boots used in standard homes with flexible duct attached to a main trunk line from the heating and A/C unit as it is done in standard homes. Works great and is much more efficient. Some local codes now will only allow the black flexible and not the silver flex duct to be used on mobile homes, check your local codes. Look at these schematic diagrams and pictures below. I get lots of questions about how to insulate the duct work on a mobile home or manufactured homes. Condensation in duct work on mobile homes is usually caused by poor insulation. I have yet to see a factory individually insulate the duct work. Think about this, let's say you have a glass of ice tea you will notice that water condensation builds up on the outside of the glass and drips onto your table. However if you place the glass in a cup koozie it stops sweating. The same idea applies to your duct work. 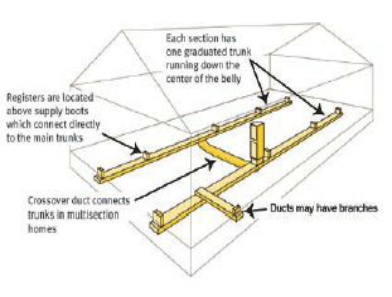 Below I have included a picture of the ideal way to insulate the main duct work trough. 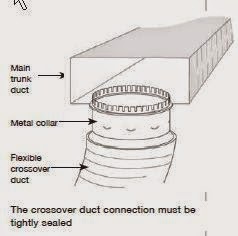 The picture shows an ideal situation where you have access completely around the duct work. This is not always the case. You can however wrap all of the duct work that you can and then staple the insulation to the floor or joists in a cradling fashion. Then insulate underneath the mobile home as suggested on the mobile home insulation page. Keeping your homes duct work clean can mean a huge improvement on your health. Most of the mobile homes I have worked on have had some serious issues with this problem. If you have an older home or have purchased a used manufactured home you may have a problem with contaminants in the duct system. There are many services that provide duct work cleaning. If you have a lot of moisture in the duct or notice any debris in there you might want to consider getting it professionally cleaned. I have installed a ultraviolet light in the return duct on my heating ac system that kills many airborne pollutants as they are drawn through the heating an air conditioning system and it seems to have helped. Look at the Mobile Home Indoor Air Quality page for more info about pollutants in homes. Be sure to keep the filters changed. Check the condensing tower to be sure that it is not clogged. Check for air leaks in the a/c heating compartment around the corners and metal framing/access doors. Incoming air should only be allowed into the compartment through the filter via the return grill. If air is squeezing in around any cracks repair them with caulking. Make sure that the blades on the squirrel cage fan have no buildup on them. This will cut down on the efficiency of the fan. Proper A/C-Heating Maintenance will keep your homes air conditioning unit running longer and help keep your power bill low. Take a look at the Electric Furnace page for more about heating systems. Q. How do I find a water leak in the duct work or why is there so much water in my A/C ducts? A. If you have water in your duct work there are 4 possible reasons. 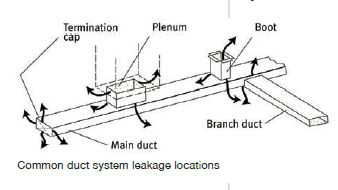 Since water lines are not run through any duct work there could be either 1. a water leak on a water line running on top of or near enough to the duct work to allow spraying water into the duct. 2. A water leak inside the home has run into the duct work through a register vent or 3. but this is the most probable cause, since the ducts are usually very poorly insulated condensation builds up in them a will result in quite a puddle making it look like there is a water leak if the air conditioner has been running for any length of time and 4. if the drip pan is clogged and overflows the water can get into the duct work.